You all know how much I LOVE, LOVE, LOVE linky parties. I have a whole page of ones that I visit each and every day. It's so much fun to find and visit new blogs, to see all the amazing projects that bloggers come up with, and to get a glimpse into other people's homes, ideas and lives. Pam and I still host the Dare to Share linky party on Saturday, so don't forget to come out and party with us this weekend, but today I'm getting to try something a little new and different. 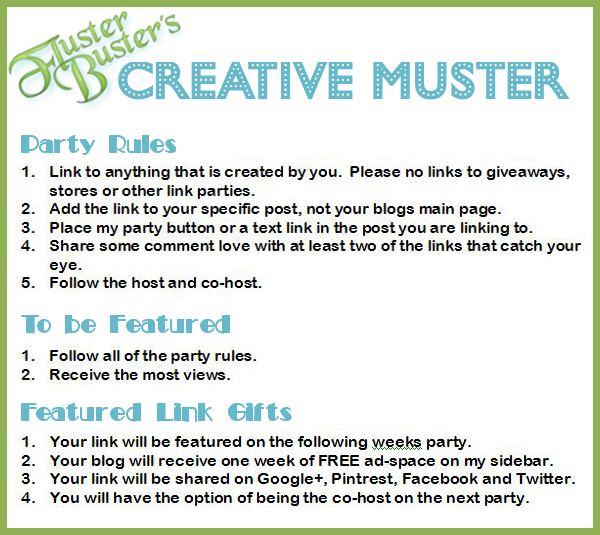 I'm co-hosting Flusters Creative Muster with my new friend and fellow blogger Robin from Fluster Buster. I'm super excited for the chance to see all kinds of new projects and meet new friends. I hope you'll link up some of your ideas for us to see and then come visiting with me to all new blogging friends. 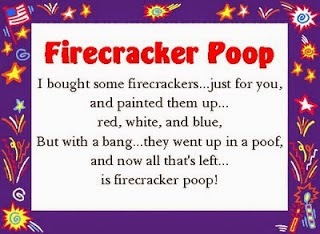 Leave it to a mom of boys to come up with a Firecracker Poop Printable. Of course, my boys got a kick out of it and wanted to print a few to give to their friends. Check out Kims Kandy Kreations to see how she uses this fun little poem to bring some fun and laughs on the Fourth of July.